The fire services in the United Kingdom operate under separate legislative and administrative arrangements in England and Wales, Northern Ireland, and Scotland. Emergency cover is provided by over fifty agencies. These are officially known as a fire and rescue service (FRS) which is the term used in modern legislation and by government departments. The older terms of fire brigade and fire service survive in informal usage and in the names of a few organisations. England and Wales (and formerly Scotland) have local fire services which are each overseen by a fire authority, which is made up of representatives of local governments. Fire authorities have the power to raise a Council Tax levy for funding, with the remainder coming from the government. Scotland and Northern Ireland have centralised fire services, and so their authorities are effectively committees of the devolved parliaments. The total budget for fire services in 2014-15 was £2.9 billion. Central government maintains national standards and a body of independent advisers through the Chief Fire and Rescue Adviser, which was created in 2007, while Her Majesty's Inspectorate of Constabulary and Fire & Rescue Services provides direct oversight. The devolved government in Scotland has a similar agency, HMFSI Scotland. Firefighters in the United Kingdom are allowed to join unions, the main one being the Fire Brigades Union, while chief fire officers (the heads of the various FRS) are members of the National Fire Chiefs Council,(formerly the Chief Fire Officers Association), which has some role in national co-ordination. The fire services have undergone significant changes since the beginning of the 21st century, a process that has been propelled by a devolution of central government powers, new legislation and a change to operational procedures in the light of terrorism attacks and threats. Fire services are established and granted their powers under fairly new legislation which has replaced a number of Acts of Parliament dating back more than 60 years, but is still undergoing change; a rough timeline can be seen below. 1938: Fire Brigades Act 1938. This Act (which is no longer in force) provided for centralised co-ordination of fire brigades in Great Britain and made it mandatory for local authorities to arrange an effective fire service. 1947: Fire Services Act 1947 This Act transferred the functions of the National Fire Service to local authorities. Now repealed entirely in England and Wales by Schedule 2 of the Fire and Rescue Services Act 2004. 1959: Fire Services Act 1959 This Act amended the 1947 Act; it dealt with pensions, staffing arrangements and provision of services by other authorities. It was repealed in England and Wales along with the 1947 Act. 1999: Greater London Authority Act 1999 This act was necessary to allow for the formation of the Greater London Authority and in turn the London Fire and Emergency Planning Authority. In 2002, there was a series of national fire strikes, with much of the discontent caused by the aforementioned report into the fire service conducted by Prof Sir George Bain. In December 2002, the Independent Review of the Fire Service was published with the industrial action still ongoing; it made radical proposals to how the fire service should be organised and managed. Bain's report ultimately led to a change in the laws relating to firefighting. 2004: Fire and Rescue Services Act 2004, generally only applying to England and Wales. 2006: The Government of Wales Act 2006 gave the National Assembly for Wales powers to pass laws on "Fire and rescue services. [and] Promotion of fire safety otherwise than by prohibition or regulation." but does not prevent future legislation being passed by the UK government which applies to two or more constituent countries. "The aim of the Fire Modernisation Programme is to adopt modern work practices within the Fire & Rescue Service to become more efficient and effective, while strengthening the contingency and resilience of the Service to react to incidents. " The fire service in England and Wales is scrutinised by a House of Commons select committee. In June 2006, the fire and rescue service select committee, under the auspices of the Communities and Local Government Committee, published its latest report. The Communities and Local Government Committee is appointed by the House of Commons to examine the expenditure, administration, and policy of the Department for Communities and Local Government and its associated bodies. This document, and the subsequent government response in September 2006, are important as they outlined progress on the FiReControl, efforts to address diversity and the planned closure of HMFSI in 2007 among many issues. Both documents are interesting as they refer back to Professor Bain's report and the many recommendations it made and continue to put forward the notion that there is an ongoing need to modernise FRSs. For example, where FRSs were historically inspected by HMFSI, much of this work is now carried out by the National Audit Office. On 8 February 2010 the House of Commons Communities and Local Government Select Committee heard evidence on the Fire Control project. Called to give evidence were Cllr Brian Coleman and Cllr James Pearson from the Local Government Association. Also giving evidence Matt Wrack from the Fire Brigades Union and John Bonney Chief Fire Officers Association. The second session heard evidence from Shahid Malik MP Fire Minister, Sir Ken Knight Chief Fire and Rescue Adviser, Shona Dunn Director for Fire and Resilience Department for Communities and Local Government, Robin Southwell CEO and Roger Diggle Project Director EADS. The committee was chaired by Dr Phyllis Starkey MP and attracted significant media attention. Because of the Government of Wales Act 2006, future legislation might be passed that can only affect England. Fire and rescue services in Northern Ireland are provided by a single entity, the Northern Ireland Fire and Rescue Service, a Statutory Corporation funded by the Department of Health, Social Services and Public Safety. 1950: When the National Fire Service Northern Ireland was disbanded, three fire authorities took control of firefighting but were unified as the Northern Ireland Fire Authority in 1950. The Fire Services (Amendment) Act (Northern Ireland) 1950 became primary legislation in the same year. Fire services in Scotland are the responsibility of the Cabinet Secretary for Justice in the Scottish Government. Previously the responsibility lay with the Secretary of State for Scotland (the relevant "Secretary of State" referred to in legislation applicable to Scotland). 1885: Creation of Scottish Office transferring administrative (but not legislative) responsibility to Secretary of State for Scotland. 1941: Fire brigades transferred to National Fire Service (NFS) to form No.11 Region]. 1947: Fire Services Act 1947 returned fire brigades in Scotland to local authority control, mostly via joint boards. 11 brigades were created resembling somewhat the NFS areas. Section 36 of the Act dealt with its application to Scotland. Parts of the Act remain in force in Scotland. 1959: Parts of the UK Fire Services Act 1959 remain in force in Scotland. 1996: Creation of additional joint boards consequent to local government re-organisation. 2002: Consultation Paper: "The Scottish Fire Service of the Future"
2003: Consultation Paper: "The Scottish Fire and Rescue Service: legislative proposals". 2004: introduction of Fire (Scotland) Bill consequent to 2003 consultation paper. 2005: Fire (Scotland) Act 2005 The scope of this act includes a "fire safety regime for non-domestic premises", but it also includes legislation that allows for the provision and operation of fire and rescue services for the eight local authority and joint board FRS in Scotland. 2006 : The Government of Wales Act 2006 gave the National Assembly for Wales powers to pass laws on "Fire and rescue services. [and] Promotion of fire safety otherwise than by prohibition or regulation.". Historically, there had been about 1600 local authority fire services under the responsibility of the Home Office in England and Wales until World War II. In 1941, the creation of the National Fire Service brought all UK fire brigades under central government control. The National Fire Service was in turn under the auspices of the Civil Defence Service. Post-war legislation returned control to the Northern Ireland Government, the Home Office (for services in England and Wales) and the Secretary of State for Scotland. "To achieve our vision by education and legislation, in an environment that encourages best practice, equality and diversity, health and safety and best value, and through inspection, to advance the development and continuous improvement of fire brigades." Directly after the May 2001 general election, control of the fire service in England and Wales passed from the Home Office to the DTLR - or Department for Transport, Local Government and Regions. This department was then broken up creating the Office of the Deputy Prime Minister (ODPM) which took central government responsibility. In May 2006, the ODPM was re-structured creating the Department for Communities and Local Government or CLG, and it became the central government department for fire authorities in England. but would be advised by a new department under the direction of the Chief Fire and Rescue Adviser - see below. The fire service minister is the most senior politician whose brief directly includes fire and rescue issues in England and Wales, other parts of the UK never having had the matter specifically under the control of a UK minister in peacetime. The fire service minister is not part of the prime minister's cabinet. The post is held by a junior minister, or Parliamentary Under-Secretary of State who reports to the secretary of state for Communities and Local Government, who takes ultimate responsibility for fire and rescue, but that is part of a much wider brief. Below national level, there are regional and local bodies whose role it is to establish a fire authority, implement the legislation from the tier above, while working alongside the relevant HMFSI and other interested bodies. The next level beneath that of local authority, is a brigade which usually comes under the operational command of a high ranking senior officer. Traditionally Chief Fire Officers have risen through the ranks from firefighter, although under modernisation plans brigades can now operate graduate entry, and fast track promotion as is already the case with the armed forces and the police. The London Fire Brigade announced details of its graduate scheme in 2007. Chief Fire Officers (CFO) 'speak' collectively via the Chief Fire Officers Association. CFOs do attend some operational incidents. Hertfordshire's CFO, Roy Wilsher, took command at the Buncefield oil depot fire in 2005, forming part of the gold command team. If a CFO attends an incident, he will usually be the commanding officer of that incident. In England, Wales and Northern Ireland fire services are inspected by what was known as the Fire Service Inspectorate. However, in February 2007, the government announced it was establishing a new unit to provide ministers and civil servants with "independent professional advice on fire and rescue issues". It will be headed by a new role that will be known as the Chief Fire and Rescue Adviser The roles carries the historical function of Her Majesty's Fire Service Inspectorate. The Chief Fire and Rescue Adviser is also title Her Majesty's Chief Inspector of Fire Services. Its role (among others)is to work towards reducing the number of fire deaths in England and Wales, and implement changes to FRS required by the Fire and Rescue Services Act 2004 In May 2007, Sir Ken Knight commissioner of the London Fire and Emergency Planning Authority was appointed as the first ever Chief Fire and Rescue Adviser. In Scotland, the Scottish Fire and Rescue Service is inspected by Her Majesty's Fire Service Inspectorate for Scotland. With effect from 1 April 2013 is a single Scottish Fire and Rescue Service (in place of the eight former regional services). Matters concerning fire fighting fell within the remit of the government of Northern Ireland, with two exceptions; the period of the existence of the National Fire Service (Northern Ireland), and the period of direct rule from Westminster when the government of Northern Ireland did not exist. Responsibility for fire and rescue services and promotion of fire safety in Wales lies with the Welsh Government. Borough: Brigades are now aligned with local councils, and because of London's size, its three commands also overlap with the London boroughs, so each borough is a small division. It now has borough teams, and a separate list of stations shows which borough it belongs to. Wholetime: Firefighters work full-time in on 2 day and night shifts within the fire service. Day crewed: Firefighters work a 10-12 hour day shift and are retained at night. Day crew plus: Firefighters work a 24-hour shift consisting of 12 hours in station and spending the night at an accommodation building on the fire station plot. Retained: Retained firefighters are on call for long periods (at least 50 hours a week) to respond to incidents. They are paid a salary for the time they spend on call and a greater amount for each incident they respond to, on average 2 or 3 per week. Many have jobs outside of the fire service. Volunteer: Volunteer firefighters are now rare, though some stations are run by volunteers in certain rural areas, such as Scotland and North Yorkshire. There are two small fire services that are run entirely by volunteers – the Peterborough Volunteer Fire Brigade and the Borth Voluntary Fire Unit (near Aberystwyth, Wales). These are contracted to provide services for a regular fire service. Large town fire stations have full-time crews, though many employ retained firefighters as well. Small rural ones are usually staffed only by retained firefighters. "The (web)site provides easily understandable guidance for the general public on how to prepare themselves, their families and their homes and businesses to cope during an emergency or disaster." Any such emergency or disaster is likely to involve a UK FRS, and the generic term for such contingency plans has become known as resilience The 'Preparing for emergencies website' gives specific government advice on fire safety, specific examples include the summer fire safety campaign, and schools' fire safety guide which are just two examples. In the UK, an FRS generally provides its services for free, although there are some special services that can be charged for, and some additional services that can be paid for. The service is free to the end user in the case of an emergency. Funding for the fire service comes from two principal sources: a central government grant, and a small levy on the local council tax. This levy is called a precept. There was a 17% reduction in fire service funding between 2010 and 2016, according to the National Audit Office. "Having regard to the changing and developing role of the Fire Service in the United Kingdom, to inquire into and make recommendations on the future organisation and management of the Fire Service..."
Bain's report was unpopular with firefighters, and a long period of industrial action started in 2002 and continued until 2003 when a new pay and conditions package was put together. One of the areas identified by Bain as being in need of modernisation was FRS approach to fire prevention and community fire safety. There is now more emphasis on fire prevention and providing public information coupled with encouraging businesses and individuals to take responsibility for providing a risk assessment of businesses — which became law in October 2006. Additionally, changes to central government, local government, and geographical boundaries have affected the fire service in the UK. The fire service in England consists of local authority brigades or FRSs, which come under the administrative control of metropolitan and shire, or county fire authorities (e.g. Essex County Fire and Rescue Service). Most statutory firefighting bodies consist of a fire authority and brigade, the former responsible for political and administrative aspects of service provision and the latter for delivering it. For example, Oxfordshire County Council is responsible for Oxfordshire Fire and Rescue Service. The armed forces, private fire brigades and airports all make their own firefighting provision. Another area identified in Bain's report was the FRS' capacity to respond to major incidents. Bain's review stated that the fire service should have specific responsibilities for: "Emergency preparedness coupled with the capacity and resilience to respond to major incidents of terrorism and other chemical, biological, radiological or nuclear threats". In England and Wales, three projects are being rolled out that will help the FRS deal with incidents like these. The projects come under the umbrella of the Fire Resilience programme. The programme will provide the FRS with a far greater resilience and control to handle all types of incident. New Dimension was the first Fire Resilience project to be implemented. It provided FRSs with a wide range of equipment and vehicles to help deal with major challenges like floods and terrorist attacks. FireLink is the new digital FRS wide area communications system in England, Scotland and Wales. The FRS use wide area radios to communicate between vehicles and control rooms but there has never been a fully compatible system. FireLink is more efficient and provides greater resilience for command and control. The fire service's ability to communicate efficiently, across different brigades and with other emergency services has never been easy. The issue was raised by Sir Desmond Fennell, who conducted the public inquiry into the King's Cross fire in 1987. Fennell recommended when his report was published in 1988 that fireground communications be addressed as an issue of "high importance". Prof Bain's report highlighted many areas of proposed change that include working practices, shift hours and time spent on fire prevention duties. One of the proposals which is now well under way is the reduction of fire service control rooms. At present, each of England's 45 (the number FRS was reduced from 46 in April 2007 with the merger of Devon and Somerset FRSs) FRSs handles its own calls from either the 999 system or mobile phone companies. Additionally, calls are accepted from the other emergency services by dedicated landlines. The FiReControl project is building nine new purpose-built Regional Control Centres (RCCs). The aim is to rationalise call handling and aim for greater communication between the emergency services. At present, 999 calls - whether by mobile telephone or landline - are answered by a BT operator, who feeds the call to a fire, police, ambulance, or coastguard Emergency Control Centre as required. Staff, known as control operators or control officers, also despatch the fire appliances, maintain radio communications and provide detailed risk and geographical information. These operators are employed by a FRS, wear a similar uniform to firefighters, and have their own rank structure. The role of specialist fire officers and control operators overlaps where they work jointly in control or command centres, but the subject of mobilising, command and control will change as the FiReControl project advances. Historically fire safety was a function of local authorities rather than the fire service however in 1947 the introduction of the Fire Services Act gave the Fire Brigades their first responsibilities for fire safety. The Fire Precautions Act 1971, the Fire Precautions (Workplace) Regulations 1997 and the Regulatory Reform (Fire Safety) Order 2005 gave more powers to the service. Today, the modernisation of the UK fire service has taken into account the role that it plays in fire safety issues and that issue is high on the agenda of most fire and rescue services. Many brigades started to produce Integrated Management Plans (IMP) to take into account these new responsibilities and produced plans for not only fire safety in the workplace but also in the community. Now all fire and rescue services have community based fire safety departments. The Fire and Rescue Services Act 2004 now lays out in Section 6 what the fire service must do. It states that a fire and rescue authority must make provision for the purpose of promoting fire safety in its area and this must include the provision of information, publicity and encouragement in respect of the steps to be taken to prevent fires and death or injury by fire not only by the enforcement of specific fire safety legislation, but also by a proactive strategy targeted at all sections of the community. Fires and fire fatalities have dropped significantly in the UK over the past ten years as seen in the graphs to the right. Primary or secondary fire - primary fires involve damage to property with an identifiable owner and are coded FDR1. Secondary fires do not and are coded FDR3. Deliberate secondary fires involving rubbish: domestic wheelie bins; commercial/business refuse bins; fixed/street litter bins; refuse /litter in the open. Northern Ireland has had a single statutory fire service since 1950. Scotland has also had a single statutory fire service since 1 April 2013, with its headquarters in Perth. Wales saw a reduction in the number of fire brigades on local government reorganisation in 1996, from eight (the number of former administrative counties) to three, made up of groups of the new principal areas. There are several specialised and private FRSs in the United Kingdom. Private airport fire services in the UK protect all categories of airports and aerodromes. They are usually referred to as rescue and firefighting services. One of the biggest aviation fire services is operated by BAA. Non-BAA airports operate their own fire services to comply with legislation which states that airports must be provided with RFFS. One such example is London City Airport; its website describes the principal objective of an airport fire and rescue service: "as to save lives in the event of an aircraft accident or incident". The number and type of firefighting appliances based at an airport will be determined by the airport's category. Airports in the UK are categorised from 1 to 10. A category 10 airport caters for the biggest aircraft; the standards are determined by the Civil Aviation Authority. The Ministry of Defence operates its own fire and rescue organisation. Originally this consisted of a civilian fire service known as the "Defence Fire Service" and the RAF Firefighting and Rescue Service. They were known collectively as the Ministry of Defence Fire Services, but in 2004 were formed into the Defence Fire and Rescue Service. This also includes private contractors brought in to protect sites such as small defence establishments. The DFRS is the largest non geographical or local authority FRS in the UK, though the training, rank structure and equipment used are similar to that operated by their local authority fire service counterparts. As a general rule the RAF personnel cover runways or airfields with particular expertise in defusing aircraft munitions, with the civilians covering domestic sites, but there were cross overs and both services could be called to airfield and domestic situations. Both RAF and defence personnel can serve abroad both in peacetime and at war. Several state properties, including royal residences and the Palace of Westminster, are protected by their own fire services in the interests of protecting sites of heritage and royal importance. The Royal Household Fire Service is responsible for firefighting at Royal properties. Some large factories operate their own private or industrial fire services to protect their interests and provide a first attack capability until local authority fire crews arrive. These companies often combine fire and medial response under the banner of "Plant Protection" BMW and Jaguar Land Rover are two examples of factories with this provision. British Nuclear Fuels and some other nuclear power station operators have their own on-site fire service. Several large ports have their own fire service, such as Felixstowe. Several private event fire safety units operate in the UK at major events such as air shows, regattas, concerts and on film sets. They sometimes use the services of off-duty fire fighters and emergency personnel to provide fire cover at outdoor events. The cover normally consists of one or two standard fire appliances with perhaps a rapid response or control vehicle. A smaller number of companies offer complex event fire safety packages for large events or civil contingencies, including the provision of specialist off-road fire appliances, dedicated pump rescue ladders and other technical and specialist vehicles. Their roles are to provide a niche response where the fire services have no legal obligation or the specialist vehicles required for the high risk category. ^ "UK Government spending" (PDF). p. 69. ^ Scottish Government, St Andrew's House (29 April 2002). "The Scottish Fire Service of The Future". Retrieved 25 March 2018. ^ "Countdown to fire strike". 13 November 2002. Retrieved 25 March 2018 – via news.bbc.co.uk. ^ "In pictures: Fire strike in London". 14 November 2002. Retrieved 25 March 2018 – via news.bbc.co.uk. ^ "Legislation.gov.uk". www.opsi.gov.uk. Retrieved 25 March 2018. ^ "The Regulatory Reform (Fire Safety) Order 2005". www.opsi.gov.uk. Retrieved 25 March 2018. ^ "LGA: Fire Service Modernisation". Retrieved 25 March 2018. ^ "House of Commons Communities & Local Govt Committee Fire & Rescue Service, Fourth Report of Session 2005–06, Volume I: introduction" (PDF). Retrieved 25 March 2018. ^ "Government Response to the Communities & Local Government Committee's Report on the Fire and Rescue Service, 29 September 2006, TSO" (PDF). Retrieved 25 March 2018. ^ "FiReControl - Communities and Local Government Committee Contents". UK Parliament. 8 February 2010. Retrieved 17 April 2010. ^ "FILE ON 4" (PDF). BBC. 2 March 2010. Retrieved 17 April 2010. ^ "FBU denounces failing fire control project as 'the worst ever'". tribunemagazine.co.uk. 19 March 2010. Archived from the original on 30 June 2012. Retrieved 17 April 2010. ^ "Blast for 999 centre delays". Manchester Evening News. 1 April 2010. Retrieved 17 April 2010. ^ "FRS Circular 3/2010 - Fire and Resilience Programme Highlights - January/February 2010". department of communities and local government. 26 February 2010. Archived from the original on 6 June 2012. Retrieved 17 April 2010. ^ "Explanatory Memorandum to Fire and Rescue Services (Northern Ireland) Order 2006". www.opsi.gov.uk. Retrieved 25 March 2018. ^ "Scottish Executive - Justice - Fire". Retrieved 25 March 2018. ^ "General History". Archived from the original on 1 October 2006. ^ "Scottish Executive - The Scottish Fire service". Retrieved 25 March 2018. ^ "NFS". Archived from the original on 1 October 2006. ^ "Scottish Executive (Justice) Fire Safety (accessed 19 feb 07)". Retrieved 25 March 2018. ^ "Fire (Scotland) Act 2005". www.opsi.gov.uk. Retrieved 25 March 2018. ^ "Fire prevention and rescue - GOV.UK". www.fire.gov.uk. Retrieved 25 March 2018. 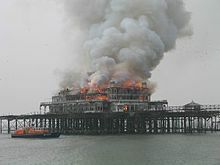 ^ "DfCLG Fire and Resilience 09 Aug 07 (accessed 12 Sep 07)". Retrieved 25 March 2018. ^ "London Fire Brigade: Graduates (accessed 03 Jul 07)". Retrieved 25 March 2018. ^ "HMFSI: Scottish Executive". Retrieved 25 March 2018. ^ "Scottish Executive: Justice Her Majesty's Fire Service Inspectorate for Scotland (accessed 30 May 07)". Retrieved 25 March 2018. ^ "Northern Ireland Assembly". Retrieved 25 March 2018. ^ "Home Page - Northern Ireland Fire & Rescue Service". Northern Ireland Fire & Rescue Service. Retrieved 25 March 2018. ^ "Welsh Government - Topics". new.wales.gov.uk. Retrieved 25 March 2018. ^ "LFEPA London Fire Brigade, Borough teams". Retrieved 25 March 2018. ^ "Retained Firefighters - UK Fire Service Resources". Fireservice.co.uk. ^ "Peterborough Volunteers Fire Brigade". www.cambsfire.gov.uk. Retrieved 25 March 2018. ^ "Borth - Mid and West Wales Fire and Rescue Service". www.mawwfire.gov.uk. Retrieved 25 March 2018. ^ "HM Government, Cabinet Office/CSS 'Preparing for Emergencies'". Retrieved 25 March 2018. ^ "HM Government, Cabinet Office: UK Resilience". Retrieved 25 March 2018. ^ "HM Government, 'Preparing for emergencies', Fire Safety". Retrieved 25 March 2018. ^ a b "Independent Review of the Fire Service, online press release 20 Sep 2002, Independent review starts into pay and modernisation of the Fire Service, Accessed 25 Sep 2006". Retrieved 25 March 2018. ^ "Devon and Somerset Fire and Rescue Service web (accessed 2 Sep 07". Retrieved 25 March 2018. ^ "Fire Statistics Monitor: England April 2014 to March 2015" (PDF). ^ "Heathrow: Corporate site - Our company, your airport". www.baa.com. Retrieved 25 March 2018. ^ "London City Airport Consultative Committee, Fire and Rescue Service (accessed 16 Feb 2007)". Retrieved 25 March 2018. ^ "Fire Service: Aviation firefighting (accessed 12 Oct 07)". Retrieved 25 March 2018. ^ "RAF Recruitment - Home". www.raf.mod.uk. Retrieved 25 March 2018. This page was last edited on 11 March 2019, at 10:39 (UTC).